B.Sc. M.Sc. B.A. Ph.D M.A. B.Com M.Phil. P.G.D B.Voc. B.C.A. B.M.S M.Com M.Des M.T.T.M. 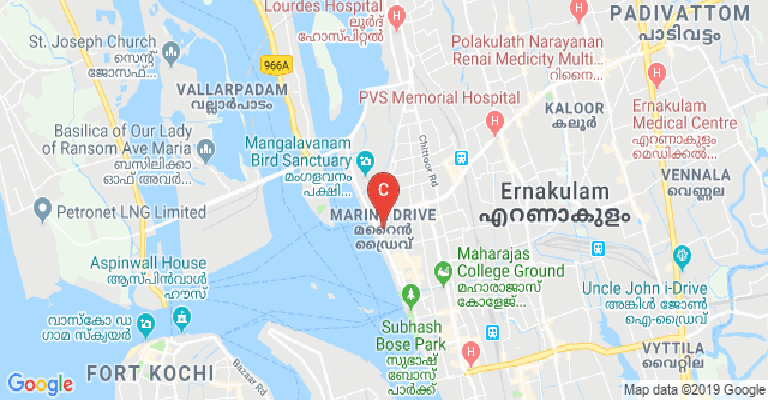 This College is accredited by NAAC A (National Assessment and Accreditation Council) validity is 20 Apr 2019 and the score is 3.4 . 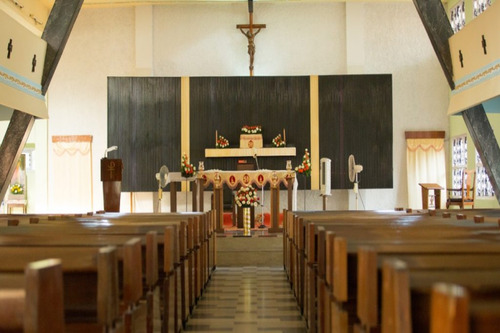 St Teresa’s college, Ernakulam is an excellent institution for academic and extracurricular exposure. The college provides quality education to its wards and aims to bring out the best in a student - be it academic or other hidden talents. The college has the necessary infrastructure required for fulfillment of its goals and strives hard to achieve the standards set for the industry. 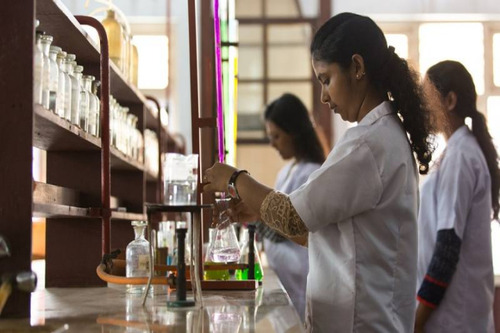 The college has the strength of qualified and dedicated faculty, well equipped lab facilities, an excellent library, good hostel, outstanding results and also offers placement opportunity. 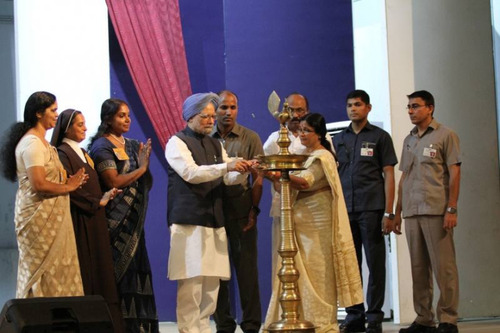 The college is also socially committed in its activity through NSS. My overall experience during the three-year tenure was thrilling and i am glad that one of my batch mates Smt. Kala is now teaching in the same dept. College alumni is also very active. 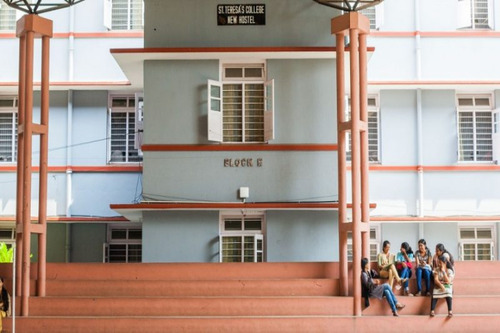 One of the oldest and best arts and science college in Kerala. The great campus to be in, and if I could I would live those days over and over.The college has a lot of outreach programmes to built up the capacities of students. 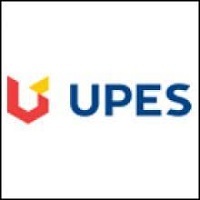 Excellent faculties who cares the student. A campus with lots of memories. St Teresa's is a college were all who join get a chance of improving their skills and making out a flexible,intellectually creative,emotionally mature,morally responsible,spiritually enlightened,socially committed and truly enlightened .Truly speaking I had a chance bringing out my hidden skills in baking anchoring without disturbing my studies,to support us there is a good team of teachers who are truly committed to their work. 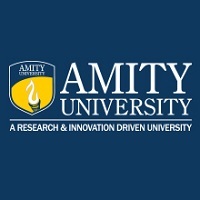 This College is accredited by NAAC (National Assessment and Accreditation Council) A validity is 20 Apr 2019 and the score is 3.4 . 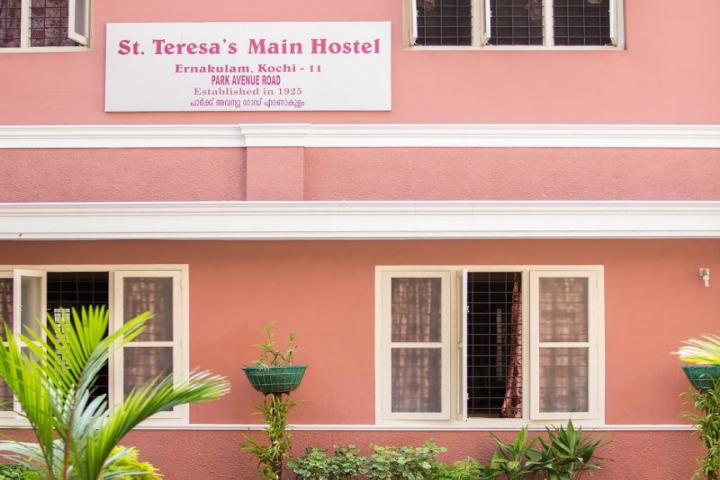 Girls Hostel :On-campus residence facilities are provided in the College. There are three hostels: one in the main block and the other two in the Science Block. 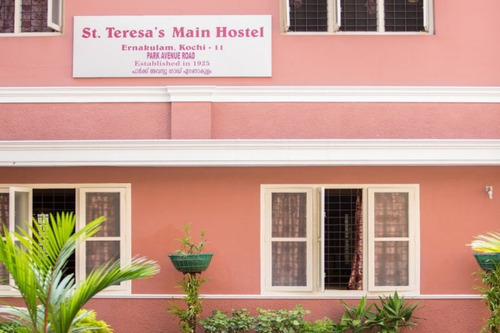 Students are accommodated in these hostels. The atmosphere in these residence halls provides a feeling of “home away from home”. The application to these hostels should be given on the day of the admission itself. 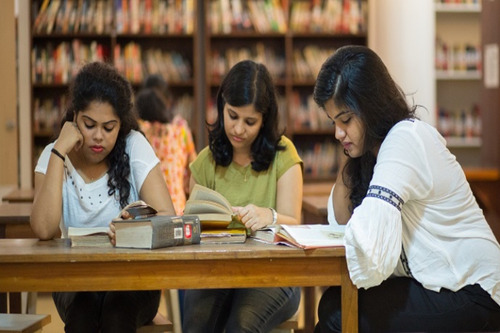 Library :The Library Block Consists of:-General reference sectionPeriodical section.Audio Visual room.Stockroom with the lending section.Post Graduate section.Research wing.UGC Network Resource CentreReprography cornerArchiveSpecial sections are maintained for Career guidance, Value education, Gandhian studies and Kerala history. 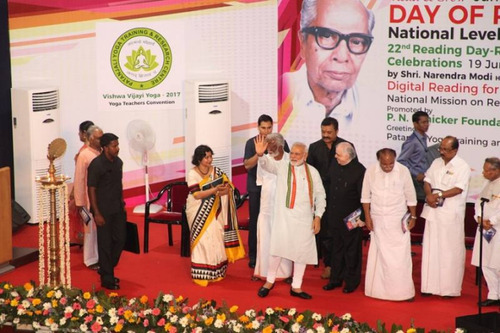 Computer database and Internet facilities are also available. At present, there are 84500 books and 200 journals and magazines in the library. For convenience, Department Libraries for Science subjects are maintained in the Science Block. A general library wing also functions in the Science Block.The Library is open from 8. a.m. to 4 p.m. on working days and Saturdays 2 p.m. to 4 p.m.A library Committee that includes the representatives of Teachers and students help to direct the library services. 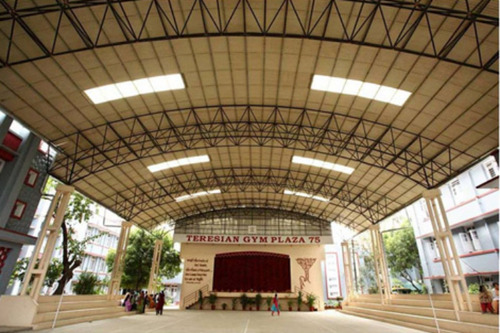 Sports :This is an indoor sports court used for various games by the students. I.T Infrastructure :The College has an audio-visual room with several audio-visual aids such as overhead projectors, slide projectors, LCD projector,Linguaphone, video camera, recording facilities etc. which are used as a teaching aid. Cafeteria :There are two canteens in the college, one in the Science block and the other in the Arts block, serving wholesome food at a subsidized rate. 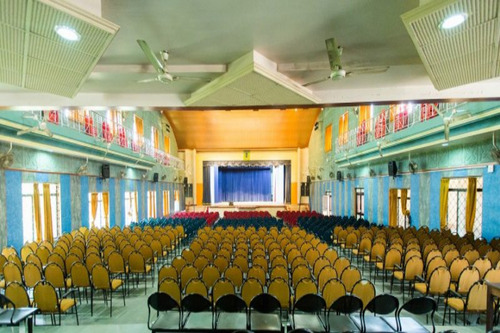 Auditorium :There are two auditoriums in the College, Platinum Jubilee auditorium with a seating capacity of 2000, and is equipped with the latest acoustic and other facilities and the Arts auditorium with a seating capacity of 1000. 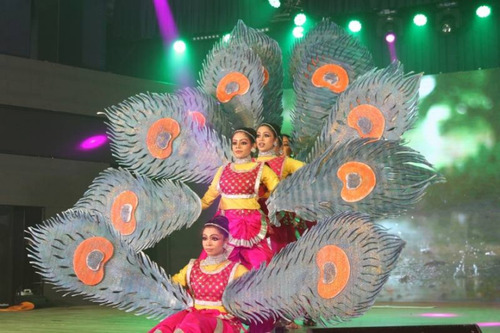 Various arts and cultural programmes are conducted here.